Smith & Nephew Allevyn™ Gentle Gel Adhesive Hydrocellular Foam Dressing with Border is for use on patients with fragile skin where secondary retention is not used. It combines a centrally located, absorbent, hydrocellular pad sandwiched between a perforated, silicone, gel adhesive wound contact layer and a highly permeable, waterproof, outer film. Its triple-action technology absorbs, retains and transpires exudates to provide optimal fluid management. Perforated, silicone, gel adhesive wound contact layer. Highly permeable, waterproof, outer film. 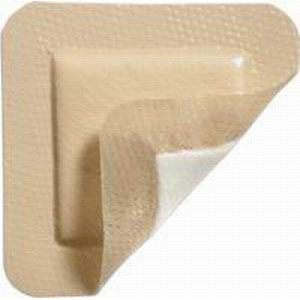 Provides an optimal, moist wound environment for the promotion of faster healing. Cost-effective, longer wear time and fewer dressing changes.